Chess is a competitive board game played by millions around the globe since the middle of the 15th century. It is played on a board comprised of 64 squares, set up in an 8×8 style grid. It looks just like a checkerboard, with the squares in each column or row alternating between two colors. It is a two-player game, and the object of the game is to “capture” your opponent’s king before your opponent can capture yours. 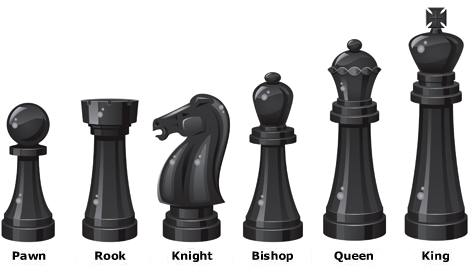 In the game of chess, there are six different pieces: rook, knight, bishop, king, queen, and pawn as seen below. 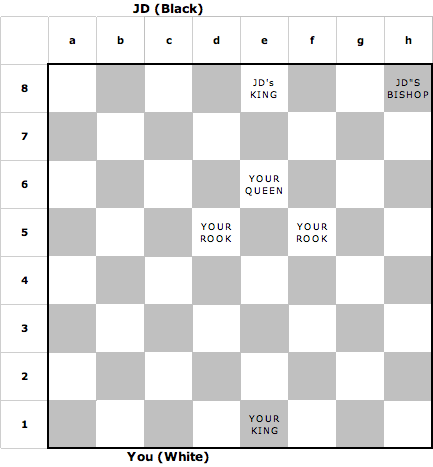 Each player (in this case, you and John Doe, or JD as he will be referred to from now on) is given eight pawns, 2 knights, 2 bishops, 2 rooks, 1 king, and 1 queen with which to play. To board will always be positioned between the two players so that the bottom right square is white. The columns are called files and the rows are called ranks. Files have the letters a-h assigned to them and ranks have the numbers 1-8 assigned. When referring to a specific box, the letter is first and then the number follows. The bottom right corner would be referred to as h1. 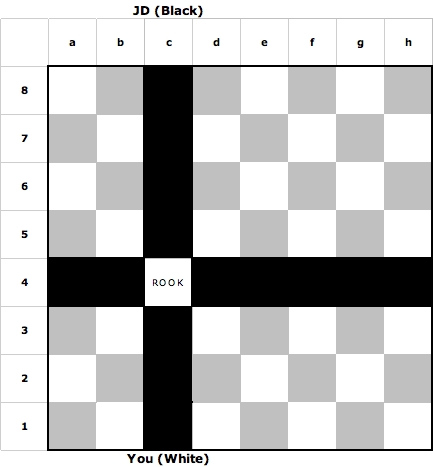 The computer will arrange the pieces on the board for you, but should you not be on the computer, the proper way to arrange them is as follows: start out with placing each rook on the ends of the first rank in positions a1 and h1. To the right of a1 and to the left of h1 go your knights. The bishops are placed next to your knights. You are now left with two boxes of different colors. 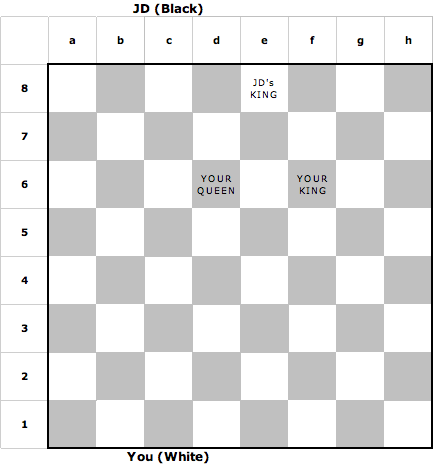 If your pieces are white, your queen will go on the remaining white box, and your king will go in the last box. It is up to the players to determine who gets the black pieces and who gets the white pieces, but the white pieces always go first. Try and think up a fair way to decide who gets which colors. 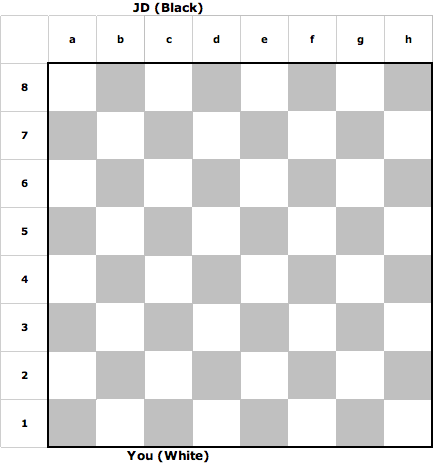 Lastly, your eight pawns will take up the entire second row, from a2 all the way to h2. Now comes the fun part: piece movement. Each piece has its own set of unique moves. We’ll save the pawn for last, because it’s the most complicated of the bunch (not sure why really, since it strikes me as being the most un-cool of the bunch). The rook is allowed to move forward, backward, and side to side as many spaces as possible, as long as there are not any other pieces blocking its path. Also, the box the piece is moving to must be empty. Only one piece can be in a square at one time. 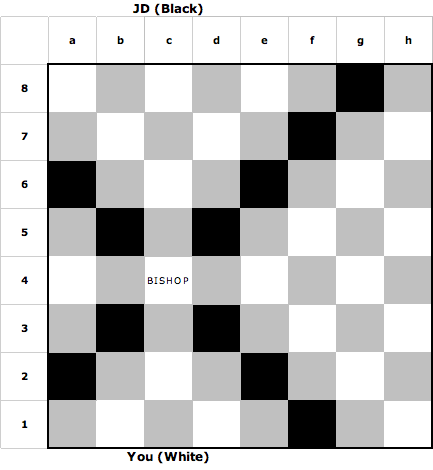 The bishop can only move diagonally in any direction. For this reason, a bishop will always stay on the same color it began on. Again, no piece must be blocking its path and its final destination must be a vacant box. The queen is the Queen B of chess piece mobility. It has by far the coolest range of moves. She is a combination of the rook and bishop. 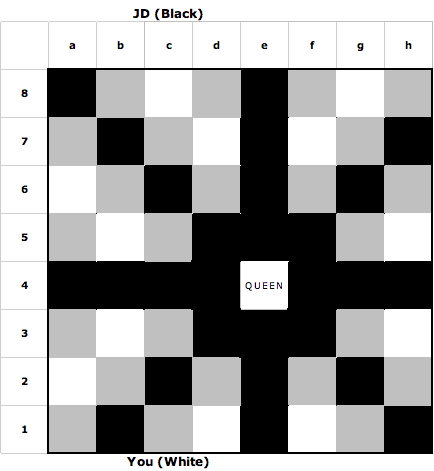 The queen can go forward, backward, side to side, and diagonally along a rank or file. Basically, she can go wherever she pleases, as long as no one is in the way of her path. She cannot however, switch from moving forward and then diagonally. It must be one direction per turn. If this sounds slightly confusing, take a look at the figure below. The king is just like his wife, but definitely not as cool, that’s for sure! He can move any direction he wants, but only one space at a time. I know it sounds like tedious movement, but the king is whom you’re protecting. You don’t want to flaunt him all over the board unless you absolutely have to. Check out the illustration below for an example of his available path of movement. Now things get a little bit complicated, but nothing I’m sure you can’t handle! The movement of the knight resembles an L, whether it is upside down, reversed, or right side up. 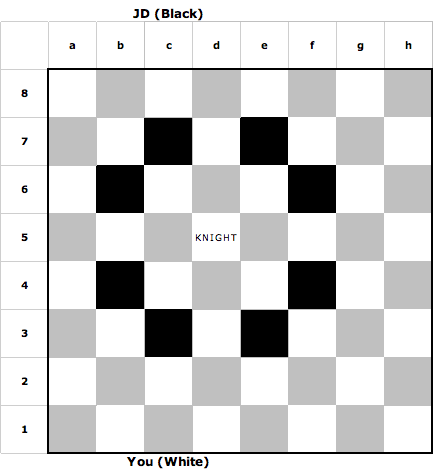 This allows the knight to move a total of three spaces. He can either go forward/backward two spaces and then left or right one space, or forward/backward one space and left/right two spaces. This might sound confusing, so definitely check out the illustration below. The knight is special though, because he is the only piece that doesn’t have to have a clear path to his final resting place. As long as he lands in a vacant box, the move is perfectly fine. He is also the only piece in the back rank that can jump over the barricade of pawns. And now we’ve saved the best for last. The pawn, first in line to defend your king should you be attacked, can only move one space forward at a time. Like I said previously, the pawn seems pretty un-cool to me with its very simple movement, but there are exceptions to every rule, and the pawn has three. First off, if it’s the first time your pawn is moving forward, you may chose to move the pawn two spaces. You don’t have to. You can let him go his measly one space, but sometimes it can be advantageous to you to move him two spaces for that first initial move. Secondly, the only way for a pawn to capture your opponent’s piece is to move forward diagonally one space. It cannot move forward one space and capture the other piece that way. The figure below shows the top left portion of the chessboard to illustrate this example. 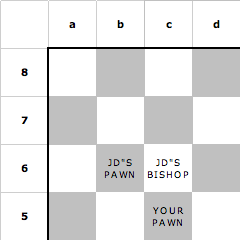 Your pawn in c5 cannot capture JD’s bishop in c6 because it lies directly in front of your pawn. Your pawn can capture JD’s pawn in b6 instead because it is one space diagonally in front of your pawn. If you did not want to capture JD’s pawn because in doing so it would be detrimental to you, then you would not be able to move the pawn in c5 until JD moved his bishop in c6. Lastly, something special happens in chess when your pawn reaches the opposite end of the board. It’s kind of like in checkers, when you get to say, “king me”. In this case, once your pawn has reached the other side, your pawn can become any other piece and take over its path of movement. I would suggest that nine times out of ten you’re going to want to make your piece into a queen. She’s the most beneficial to you since she can go any direction she wants. Now that you know where your pieces can go, it’s time to discuss how exactly you capture that king. Before taking JD’s king, he must first be tipped off that his king is in trouble. There are three situations one can get themselves into where their king will be in trouble: check, stalemate, and checkmate. ‘Check’ is merely a warning to your opponent, JD, that if he does not move his king, your next move will capture him. 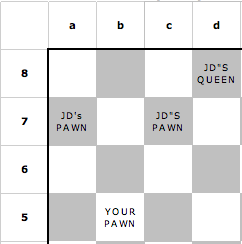 In the figure below, your queen has been moved from b2 to e4, thus putting JD’s king in check. 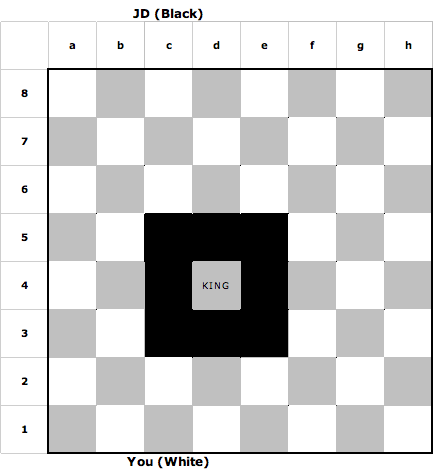 If he does not move his king, you can move your queen on your next turn and capture his king in e8. He has three choices; he can either move his king to a safe location, or move another piece in front of it to block your path, thus sacrificing that piece if you chose to capture it. 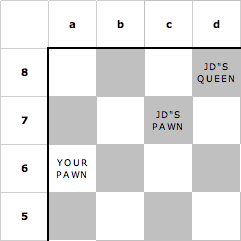 The third option is for JD to find a way to capture your queen and eliminate the threat. ‘Checkmate’ occurs when JD’s king is in check, and no matter where he moves, how he blocks his king, or who he captures to protect it, his king will still be in check. When this happens, you have won the game. This is the only way the game can be won. No matter where JD moves his king, your queen or rook can capture it. He’ll always be in check. The bishop is of no help. This is checkmate. A ‘stalemate’ is kind of like a tie. It occurs when your king is safe, but if you were to move him anywhere, he would be captured. You can’t pass on a turn in chess, and since moving your king would end the game; a stalemate is called. I know it sounds like an anticlimactic ending to what can be a very long game, so avoid it if you can. Do you see why this would be considered a stalemate? 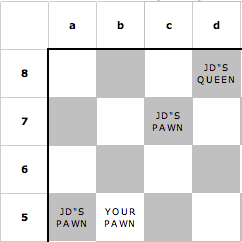 JD’s king is safe where he is, but if he moves to d8, f8, d7, e7, or f7, your queen can capture him. All right. It’s now time to get down to the nitty gritty. Chess strategy can be very involved and confusing, but since I assume you are reading this because you don’t know how to play chess, you probably aren’t looking for some crazy moves to impress your friends. Like any game, the more you play, the better you get. You’ll learn things as you go along, so we’ll just stick to basic strategy to get you going. Each piece has a value assigned to it. This makes it easier for you to decide which piece is more valuable to you, should you have to chose to sacrifice one over the other. Pawns are worth one point, knights and bishops are worth three, rooks are 5, and your queen is 9. Your king has no real number value, because it is most important. You’re never going to sacrifice it over another because that would obviously end the game. It’s so invaluable that we don’t give it a number. It’s a good idea to gain control of the center squares (d4, d5, e4, e5). They offer the most control of the board, so if you can, get control of them! Don’t jump the gun and bring out the most important pieces too early. Your rooks and queen are key players, so bringing them out too early may cause you to lose them. What you can do is bring out your knight. They are good for attacking since they can jump over pieces. Though you are playing as one person pitted against another, you and your pieces are still a team. Your moves will have consequences, so think ahead. If you move a pawn and it gets captured, have a piece that can back that one up and capture the piece that captured yours. A little payback never hurt anybody, right? Think as a team and think in advance. I’ve saved some of the more complicated items for last. There are two special moves that some of the pieces get to do: en passant and castling. En passant is a French word, which means in passing. This happens when your pawn is in rank 5, two ranks away from JD’s pawn. He moves his pawn two spaces (he can do that the first time a pawn is moved, remember?) so that his pawn is directly next to yours in a5. If he had chosen to only move his pawn one space, it would be in a position for you to capture it. En passant allows for you to capture his pawn in this scenario. If you are going to use en passant, you must do so on the turn after JD moves his pawn next to yours. You cannot wait till two turns later to decide you want to use it after all. Your pawn in b5 moves to a6, where you would have captured JD’s pawn if he had chosen to only move one space, and you have captured his pawn in a5. Castling comes in handy when you feel that you’ve left your king open to attack. You may use this strategy if one of your rooks and your king are still in their original boxes and have not been moved. You move your king two spaces towards your rook and then place your rook on the opposite side of your king. This is called castling, since you rook looks like a mini castle. This is the only time you will be allowed to move two pieces in one turn. Look at the figures below to get a better understanding of this move. Your king rests in e1 and your rook is in h1. You then move your rook two spaces to the right into f1, and then your king goes to the opposite side of the rook into g1. Chess can seem confusing at first; I felt a bit overwhelmed! But practice makes perfect. The more time you put into playing the game, the better you’ll be. Then you can step things up a notch and try some of those more complicated strategies. Be patient, and you’ll be a chess pro in no time!